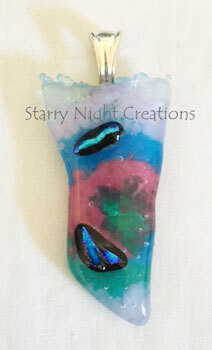 "Swirled Crystal" a distinctive Dichroic Glass Pendant featuring fusible art glass in Lavender, Blue, Rose, and Sea Green; back of pendant features white strings & accent glass. A silver flared Bail is included & attached, and is Artist signed (by me). An Organza Gift Bag is included, especially great for gift giving. Purchase of This pendant INCLUDES a Necklace of YOUR CHOICE: 18" Black Rubber Necklace, an 18" Silver Necklace, or an 18" Black Satin Necklace. Select your Choice, then click "Add to Cart". Some are happy with just the Pendant (and no necklace) ... please choose "None (No Necklace)", and just the Pendant will be sent in the Organza Gift Bag.